The Pineapple (Ananas Comosus) is a tropical plant with edible fruit. This popular fruit is eaten raw or is an important ingredient in various pies. It is widely used to flavor ice creams and shakes. Pineapple is rich in fibers, vitamins, minerals, nutrients and anti-oxidants and contains over 80 nutrients. The following are some of the most well known Health benefits of Pineapple. Fresh pineapple is low in calories (100 g fruit provides just about 50 calories). Nonetheless, pineapples are loaded with vitamins and minerals including vitamin A, vitamin C, calcium, phosphorus, and potassium. This one cup (165g) serving contains 131% of your daily vitamin C! In addition, this fruit is rich in B-complex group of vitamins like folates, thiamin, pyridoxine, riboflavin and minerals like copper, manganese and potassium. All the nutrients it contains promote good health. People are always very concerned with their teeth that they sometimes fail to give importance to the gums, which are equally essential since gums hold the teeth in place and pineapples further strengthen these gums. Pineapples are acidic in nature; this helps them to prevent any bacterial growth in the mouth thus discouraging plaque growth in the buccal mucosa (the mucous membranes lining the inside of the mouth). Fresh pineapple is the main source of bromelain, which helps the body break down protein particles during digestion, encouraging overall digestive health. Bromelain also has anti-inflammatory, anti-clotting and natural detox properties. 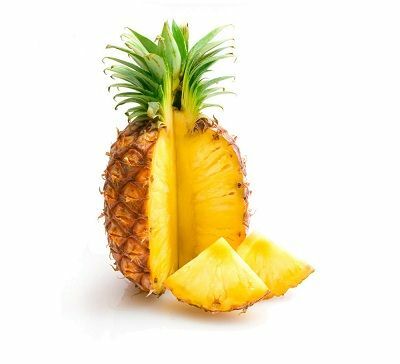 Research shows, bromelain helps accelerate the healing of wounds, sinus inflammation, digestive disorders, arthritis, and asthma. Pineapple is rich in manganese that is necessary to build strong bones and connective tissues. In fact, if you consume a cup of pineapple, you can already get 73 percent of your total body requirement for manganese. Macular degeneration is a disease which is the primary cause of vision loss in adults, is caused by damage to the retina. Beta carotene present in pineapples is very good for our sight and thus should be consumed regularly. Including pineapple in your diet can lower risk of this disease by as much as 36 percent. Taking in too much of the fruit’s bromelain can result in skin rash, vomiting, diarrhea and excessive menstrual bleeding. Large doses of the enzyme could also stimulate uterine contractions, potentially leading to miscarriages in pregnant women. Some people may experience allergic symptoms such as skin becomes red and itchy after eating pineapple. To avoid this, dip pineapple in salt water before consumption. In addition, Ripe pineapple fruit in fact contain high levels of sugar. The diabetics should not consume excessive pineapple.